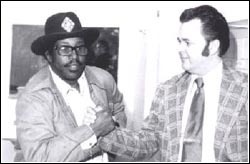 Looks like Bill is arm wrestling with Bo Diddley! EARLY MUSIC: Bill Griggs grew up during the exciting era of the 1950s. He attended many rock ‘n’ roll shows and met many of the artists of that era. He is also a pack rat and has kept paper items, autographs, photos, and other items from that era which allows him to do what he is doing today. 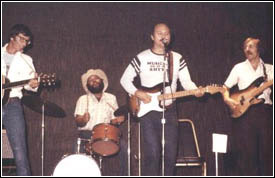 Bill Griggs with Danny and the Juniors, Danny Rapp is second from left. 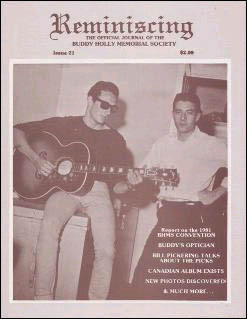 THE BUDDY HOLLY MEMORIAL SOCIETY: During the 1960s, Buddy Holly had sorta been forgotten. In 1971, Don McLean released "American Pie", and in 1973, that famous line appeared in the motion picture American Graffiti ("I hate that surfin' stuff. Rock 'n' roll's been going downhill ever since Buddy Holly died.) Still, the so-called Buddy Holly "revival" wasn't happening. The highlight at the first BHMS convention was having the Crickets perform just for us. 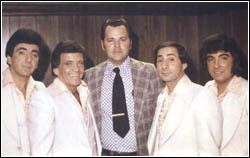 Niki Sullivan, Jerry Allison, Sonny Curtis, and Joe Mauldin. This marked the first time the original Crickets had performed together since 1957! The reality is that Bill Griggs founded the international Buddy Holly Memorial Society in 1975 out of disgust. He wasn't seeing Buddy in print, or on television, or really, anywhere. The BHMS, as it was called, ran from 1975 through 1991. At the time it was terminated, there were more than 5500 members located in all 50 states and in 34 foreign countries. During the term of the BHMS, Bill Griggs began publishing his Reminiscing newsletter that soon became a full-fledged magazine. This is the first Reminiscing cover when the publication changed from newsletter to magazine.